Baldasaro is currently serving his fifth term in the New Hampshire House. He’s also co-chairing Trump’s veteran’s coalition, having retired from the Marine Corps some 22 years ago. In July, he was investigated by the Secret Service after saying on the radio that Clinton should die because of Benghazi. “Hillary Clinton should be put in the firing line and shot for treason,” he continued. These remarks are worth quoting in full because they’re so flabbergasting; if you delivered them on Facebook or standing on a street corner, the cops would be arriving to chat with you in probably a matter of hours. 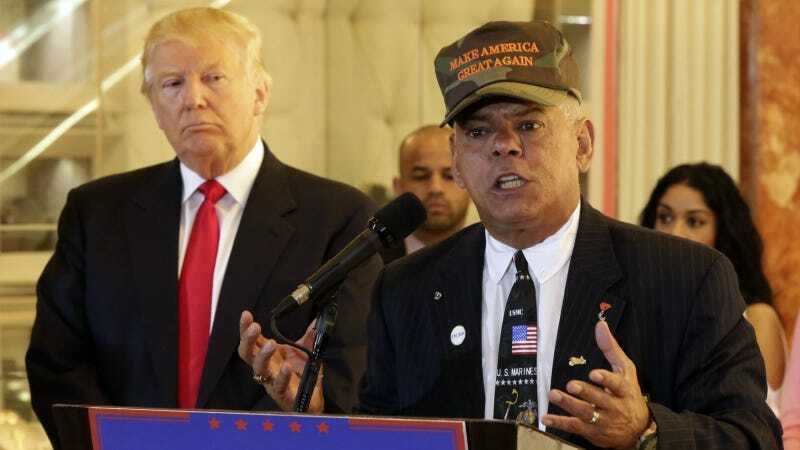 But New Hampshire state Rep. Al Baldasaro, a Republican who co-chairs Trump’s national veterans’ coalition, stressed that he was not saying someone should assassinate Clinton. This is, of course, a little more than a week after Donald Trump suggested “Second Amendment people” could do something about Hillary Clinton. I mean: are these batshit motherfuckers trying to get her killed? It’s hard not to liken this to the route favored by certain sectors of the anti-abortion movement, where they demonize and dehumanize an opponent until some angry, disaffected person with a loose grasp on reality decides to take them at their word.